LOL/OMG: Hal Lovemelt - first person ever Photoshopped? "The software at that time was called Digital Darkroom and it was top secret and in internal development. My biggest challenge is that no one understood what image editing was and a lot of people were skeptical that everyday people would ever use it. I believed in the product and wanted to bring it to market but I needed a graphic representation that everyday people could relate to. I gave my product manager a bunch of family photos that I had taken in Hawaii and he created this from the cute photo of you. 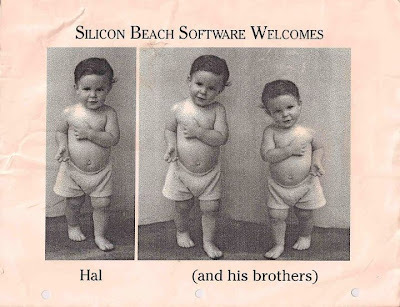 I had told him that Mike and you were visiting San Diego so he made this first version (That's why it says welcomes Hal and his brothers). Granted it's still not a very practical representation of real world use (how many people need to transform their kids into taller or shorter versions?) but because it was cute, it captured everyone's attention. When we rolled out the product at MacWorld, we had demo computers set up at our booth and transforming you was the demo. We had some nicer collateral handouts with a better version but this little paper is all that survived." If Hal indeed really is the first person to be Photoshopped, that's a pretty cool claim to fame.